Tina had a wish!! A wish to fill football stadiums. 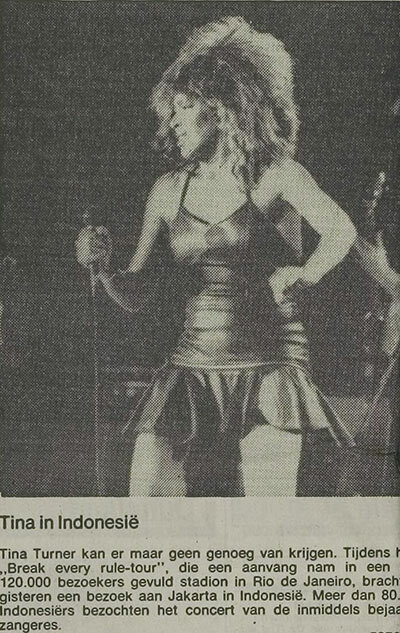 Well her wishes came true during the South American leg of the "Break Every Rule World Tour" in 1988. 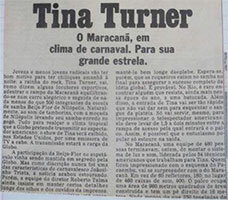 Tina started on the 3rd of January in Argentina’s River Plate Stadium, Buenos Aires to perform for 60.000 people. It was a one night only massive concert with huge promotions and a lot of press during her arrival. It wasn’t clear if Tina was able to perform. Tina caught a terrible flu and she actually had a very high fever. This didn’t brought Tina down cause she made a clear statement. "My fans have been waiting for so long, and I don’t want to disappoint them by sending them home. They expect to see me and I will be there". 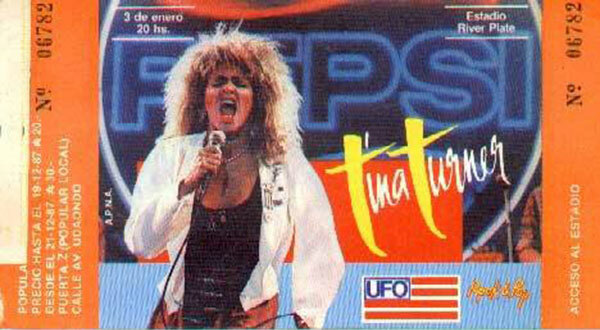 Tina went on stage, with a high fever and the knowledge that this concert would be live broadcasted on Argentinean TV. She gave it all and it turned out to be an explosive concert. After the concert there was a mass arrest of 150 people. Not much harm was done cause of minor incidents like drunkenness. Here’s an article of the New York Times about it. We also have some video’s to share with you from that explosive concert. Enjoy! 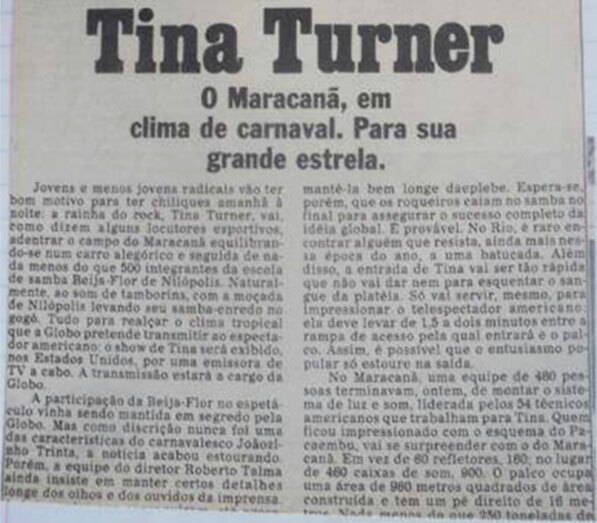 Tina would give 2 concerts in Pacembu Stadium with an attendance of 45.000+ each night. We could say it was the foretaste of the record breaking concert of Rio De Janeiro. 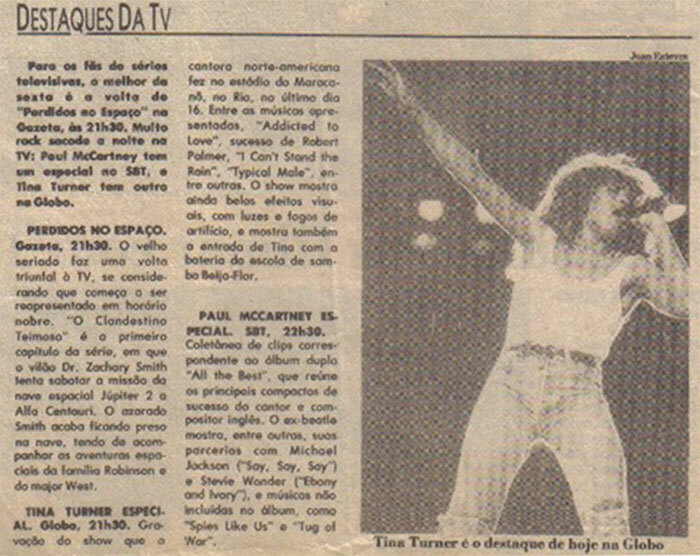 Although Tina gave two terrific performances in Sao Paulo, we found out years later that Tina added the song "Steel Claw" during her setlist for this (particular) concert. 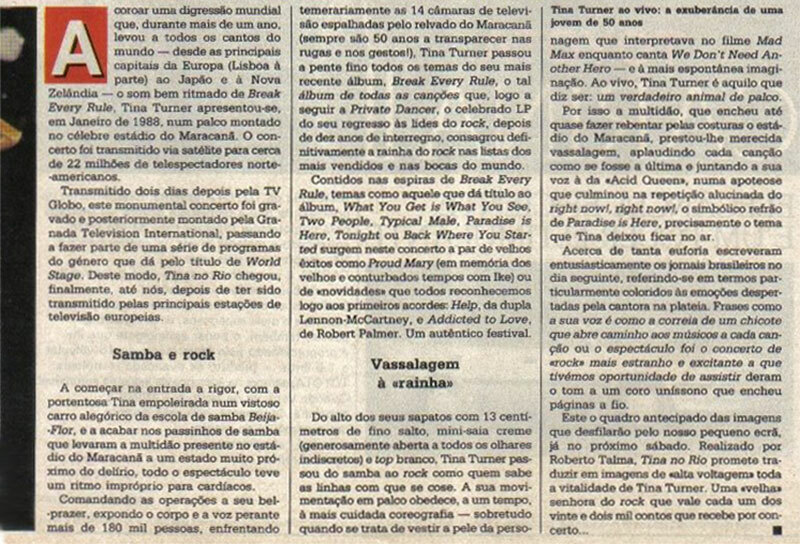 We’ve found a very beautiful picture of this concert together with a few Brazilian clippings and a TV Report of the concert. Enjoy! People seems to have added a date in Chile for the "Break Every Rule Tour", but we certainly have no proof if Tina really gave a concert there. According to some sources the concert was cancelled because the government of Chile didn’t allow huge concerts to be given. For now we still aren’t sure so we will go on with the last date of the South American Tour. The Ultra Massive concert in Rio De Janeiro, Brasil. This concert was worldwide headline news. They knew Tina wanted to make her wish come true to fill football stadiums. Well that wish came true when Tina filled the biggest football stadium of the world. With an attendance of 188.000 people Tina probably still holds the record for biggest paying audience for a single performer. The concert was broadcasted via satellite and was later released on VHS and DVD. Unfortunately they’ve never released the full concert. 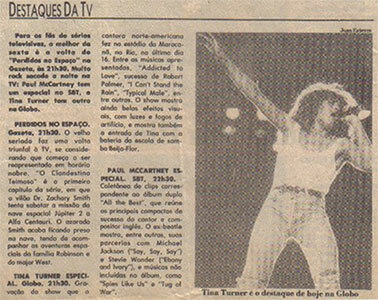 We have some backstage pictures for you of the Rio concert, clippings and unreleased footage of the concert. 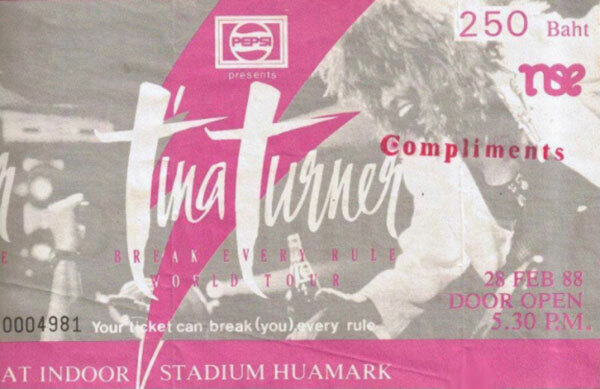 Tina started her Australian leg of the "Break Every Rule World Tour" on the 26th of January 1988 in Perth. Somehow fans have gotten bad information about the Australian Tour. 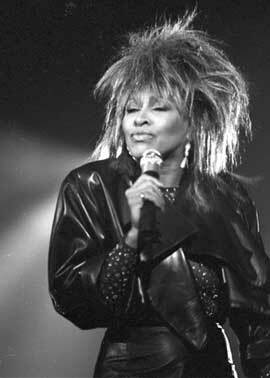 As for now, we don’t have any information about Tina’s Australian Tour. We’ve found an old entry ticket and 2 pictures. One with a person on the airport of Perth, and one from a newspaper which remains unknown. However it seems Tina did tape a commercial for the Rugby League. They’ve used the song "What You Get Is What You See". The commercial however was taped in the UK. Another interesting thing happened during Tina’s stay in Australia. Tina was asked to make a series of commercials to battle the petrol sniffing among The Aboriginals. Here’s the synopsis for the commercial founded by the archive of the Sydney Morning Herald. We weren’t able to find the commercials yet, but if we find them, we’ll make another blogpost about it. 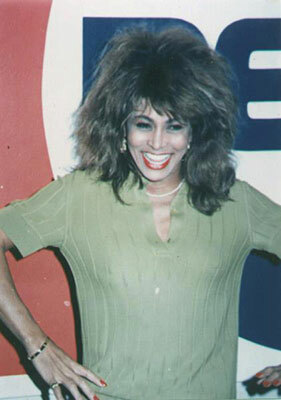 Tina Turner made a series of television commercials telling Australia's Aborigines to be a winner. The message, to be televised in the Northern Territory, states ". . . You know grog can be a bad sickness. And so is petrol sniffing. They can kill your culture and they can kill you. Aboriginal culture is something to be proud of." Next stop Indonesia, Singapore and Malaysia. 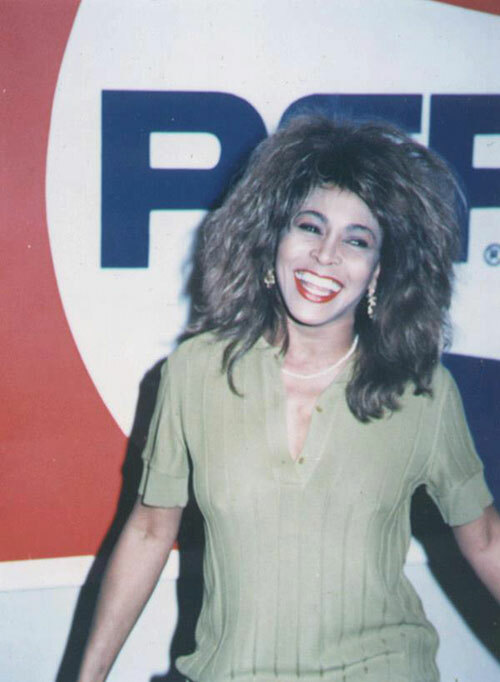 Tina was asked to extend her tour by the promoter Pepsi. Tina would perform at Huamar Stadium on the 26th and 28th of February. 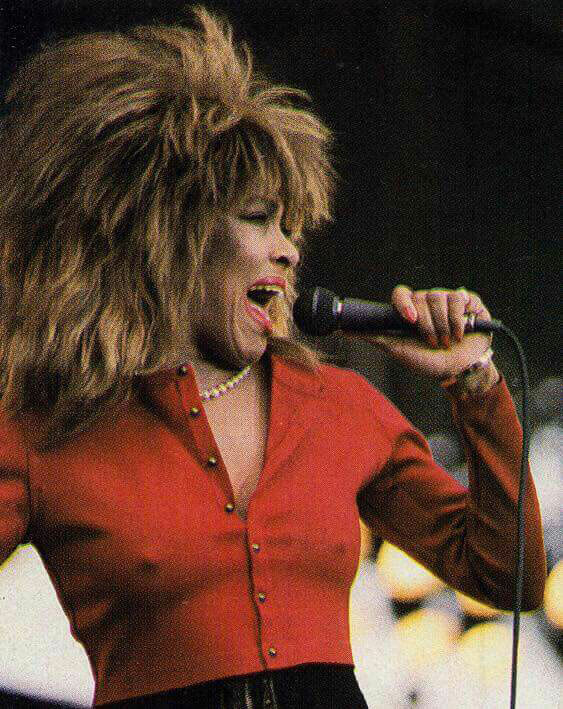 During the "Private Dancer Tour" Tina didn’t sell out the small venues. As a matter of fact, she sold half of the tickets. 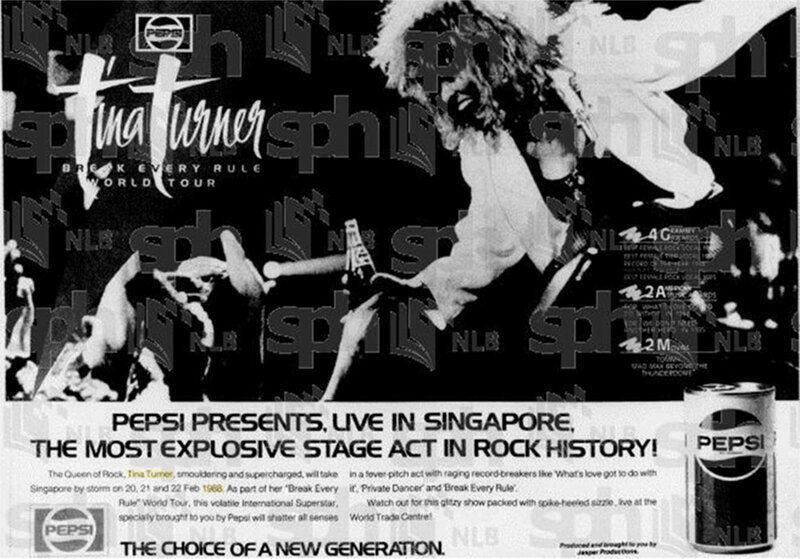 This stadium was sold out in no time and Tina gave a splendid performance. Here’s a report of her stay in Thailand 1988. Last stop of this tour………. Japan. 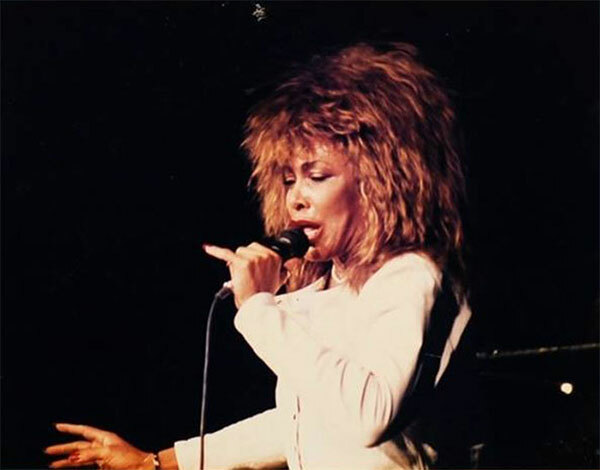 Tina performed 4 dates in Yokohama, 2 dates in Tokyo and 4 dates in Osaka. 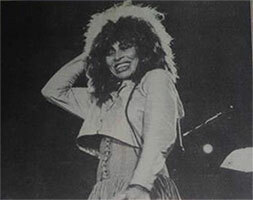 We don’t have any information or memorabilia of Tina in Yokohama and Tokyo, except for Tina’s legendary performance with Mick Jagger during The Rolling Stones concert in Tokyo. Tina joined Mick during the songs "Brown Sugar" and "It’s Only Rock ‘n’ Roll". After those guest appearances by Tina on Micks Show, Mick joined Tina during her concert in Osaka to do "Honky Tonk Women" together. We have a recording of the Osaka concert to share with you. Enjoy this recording from the 27th of 1988 in Osaka’s Castle Hall. 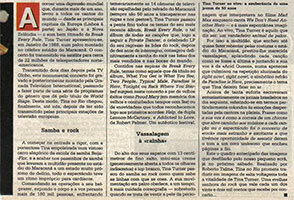 Before we end this post we would like to make a clear statement to all publishers, record labels and Tina’s management. We still hope to this day, that they will release more of the "Break Every Rule Tour". For instance, A 30 year deluxe edition with the b-sides and 12" of this period. We think that this amazing Tina album is totally overshadowed by the "Private Dancer" album. It really is too bad for us Tina fans to keep this amazing record breaking period of Tina’s career away from us devoted fans. 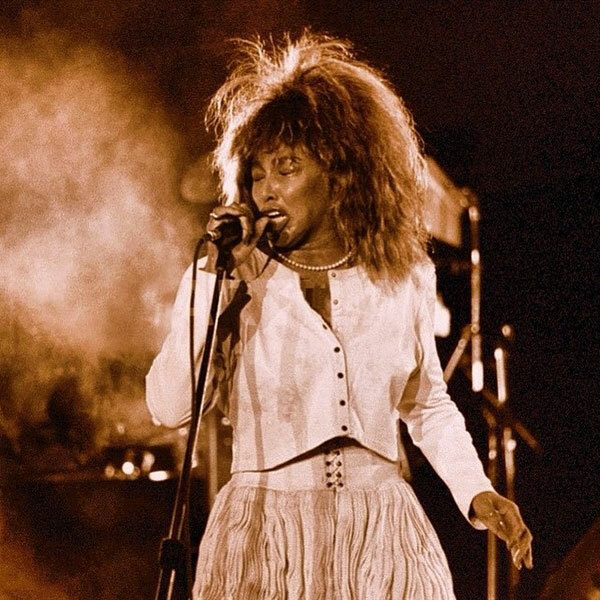 We also would love to see a full concert of the "Break Every Rule Tour" (for example the full Rio concert), and DVD releases of Tina’s official 1986/1987 music videos and a release of the HBO "Break Every Rule" Special taped in Camden Palace, London. 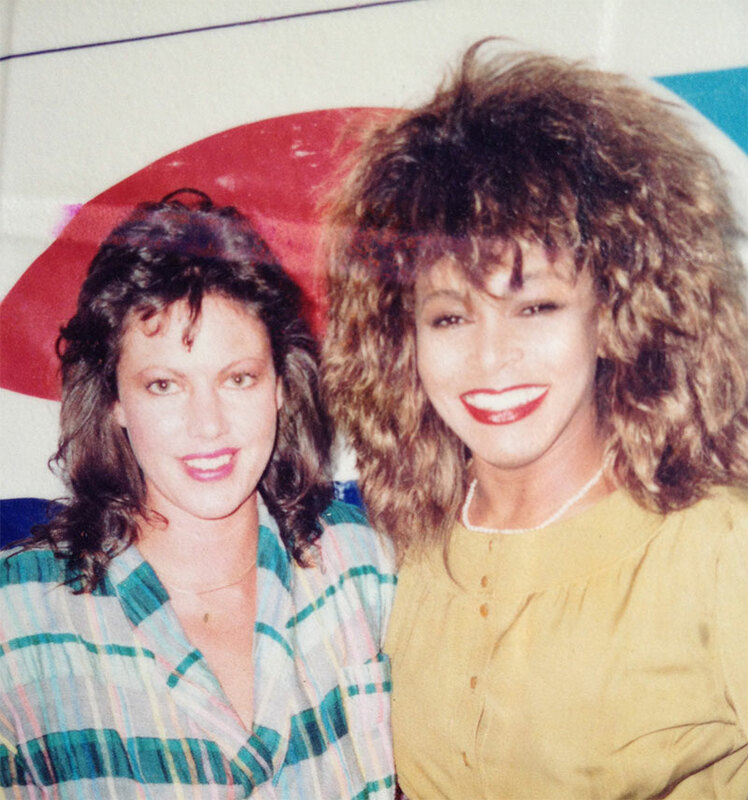 We sure hope something can be done for us fans, because Tina is retired and we sure respect that, but it is difficult to accept that so much material is laying on dusty shelves without getting the recognition that our Queen Tina deserves. This journey has come to an end. 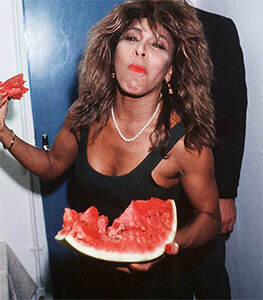 We hope you all liked this trip to the past of Tina’s biggest tour in history. We will continue this month with another album’s anniversary. Stay Tuned , Be Happy and Be Good!!! !